Lore: This talisman glows with Leprechaun magic! The Lucky Rabbit's Foot is a promotional item which was made available for the Easter season on March 17th, 2017. Players could claim either the Pot of Gold, a re-release, or this new item. The release thread can be found here. 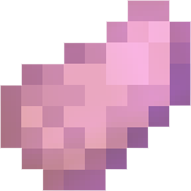 When held in either hand, the earlier version will increase the player's chance of obtaining items of higher quality in loot tables by 25% (higher Player Settings can reduce this effect). This can effect loot chests, fishing and custom mob drops (alongside Looting). A second version of the item became available as a mob drop from the Enraged Rabbit, which was added in the second version of the Survival Updates. This version applies the same 25% Luck effect, but for five minutes when you right-click while holding it. It does consume on use. Around Christmas, Lucile was hitting the Egg Nog and Hot Chocolate kinda hard. She accidentally left her lucky rabbit foot at the North Pole, which just so happened to be where EMC was having an /event. Aikar didn't realize what he picked up in his inventory when he was taking a stroll through the Holiday Village, but suddenly he noticed that his luck had increased. When opening chests in the chest hunt, he was constantly finding more valuable items than was normal. He began to think about what could have caused this. As he was loaded down by his loot, something fell out of his pocket. He reached down for it and noticed it was a rabbit’s foot. Not just any rabbit's foot though; this foot had a lore attached to it and glowed with an unearthly energy. It said: This talisman glows with Leprechaun magic. Aikar looked at his cat and his cat looked at him. He made a plan to run this lucky rabbit's foot through the duplication machine that was tucked away in the closet for safe keeping. Aikar proclaimed that 2017 St. Patty’s Day would get a new /promo. Now the players of EMC have a choice to choose between the Pot of Gold or Lucile’s Lucky Rabbit's Foot.